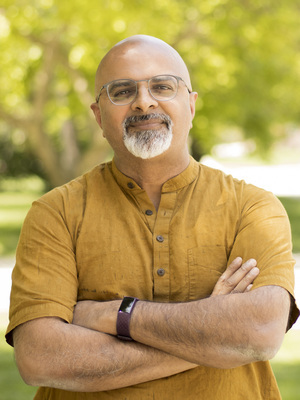 Pranav Jani is associate professor of English with a focus in postcolonial studies and US ethnic studies. His research and teaching interests lie in the literatures, cultures and history of colonized and formerly colonized people (in Africa, Asia, the Caribbean and Ireland) and people of color in the United States. In particular, Jani specializes in South Asia and the South Asian diaspora. In his book Decentering Rushdie (The Ohio State University Press, 2010), Jani analyzes the emergence of Salman Rushdie and other postmodern writers in light of the failings of decolonization. His scholarly articles and reviews focus on South Asian literatures and cultures; Marxist theories of imperialism, culture and history; gender and race in South Asian American communities; and the lives of Indian revolutionaries. They appear in journals and anthologies like: Callaloo; Critical Sociology; Globalizing Dissent; Historical Materialism; International Socialist Review; James Joyce Quarterly; Journal of Asian Studies; Marxism, Modernity and Postcolonial Studies; Postcolonial Studies; Prose Studies; and Tracing the New Indian Diaspora. Jani's current research investigates the 1857 Revolt in British India and its impact on Indian political and cultural imagination. He has also begun studying the racialization of South Asians in the US in relation to other people of color. Jani also engages in intellectual, cultural and political communities at Ohio State that overlap with his research and teaching. He is formally affiliated with the Department of African American and African Studies, the Asian American Studies Program, The Department of Comparative Studies, The Middle East Studies Center, the Mershon Center for International Security Studies and the South Asian Studies Program. He is also advisor for several Ohio State student groups, including International Socialist Organization, Students for Justice in Palestine and Syrian Students Union. In 2016, Jani received the Dr. Marlene B. Longenecker English Faculty Teaching and Leadership Award. He has been invited as a speaker by campus groups, high school teachers and community organizations in Columbus and around the country. Jani serves on the Executive Committee of the South Asian Literary Association (SALA). Decentering Rushdie: Cosmopolitanism and the Indian Novel in English. Columbus: The Ohio University Press, 2010. "Marxism, Mediation, Historiography: Writing About 1857." Critical Sociology 27 (April 2016): 1-15. “Bihar, California, and the US Midwest: The Early Radicalization of Jayaprakash Narayan.” Postcolonial Studies 16.2 (June 2013): 155-68. “Karl Marx, Eurocentrism, and the 1857 Revolt in British India.” Marxism, Modernity, and Postcolonial Studies. Eds. Crystal Bartolovich and Neil Lazarus. Cambridge: Cambridge University Press, 2002. 81-97. “Marxism and the Future of Postcolonial Theory.” Rev, of Postcolonial Theory and the Specter of Capital, by Vivek Chibber. International Socialist Review 92 (Spring 2014): 105-21.